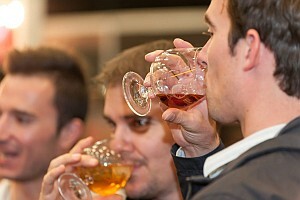 Cape Town Brandy Festival: Thumbs Up! The first installation of Cape Town Brandy Festival could not have been a bigger success. The perfect sized venue at the CTICC was decked to the rafters with stunning brandy stands, with a huge representation from brandy producers big and small. Highlights for me included a bit of brandy fun at the collisons mixology and canape experience, getting an uber exclusive tasting of the super smooth Klipdrift Legend brandy, a leisurely tour through the Oude Meester premium range of Solera, Rene Single cask and VOV, and of course getting a few samples of the uber smooth KWV 15 and 20 year olds. Also really enjoyed the Louisenhof Marbonne brandy on display, as well as old favourites from up the route 62, Joseph Barry range and the Ladismith 8 year old in the stylish square bottle. All in all it was a very well put together and professional event, great brandies, food and entertainment. A treat for old brandy fans, and a pleasant suprise for those new to the brandy scene. It really showcased the best of local brandy, and proves yet again why our South African Potstill brandies are the best int he world. If the Cape Town iteration of brandy festival is anything to go by, Joburg has a lot to live up to. The delighted response from Capetonians to the inaugural annual Fine Brandy Fusion festival held over two nights in their city was neatly encompassed by a trendy young festival-goer’s comment: ‘Off the hook!’. U rban slang for a fresh and happening event going beyond expectations, it joins the praises of close on 2 500 brandy enthusiasts who celebrated South Africa’s world-class, international award-winning brandies at the event. These visitors’ multi-cultural origins across both the age and gender divide, indicate the wide appeal and huge potential for growth in the quality brandy market. The event, designed to reflect both the sophisticated and fun sides of Cape brandy, marked its Cape Town debut with the theme ‘Celebrate liquid gold’. Standard Bank is the main sponsor, showing a firm commitment to South African producers. It was a spirited homecoming for the country’s most-loved spirit. “Imagine our delight that we could host the Cape debut a stone’s throw from the spot where brandy was first distilled on a ship docked in Table Bay harbour 341 years ago,” says Christelle Reade-Jahn, director of the SA Brandy Foundation. 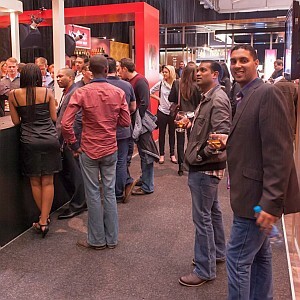 Fine Brandy Fusion’s counterpart in Gauteng is now in its 6th year, and will again be held at the Sandton Convention Centre, from 26 – 28 June. More than 55 brandies were in the line-up. Made by South Africa’s leading distilleries, specialist brandy cellars and renowned wine farms (increasingly adding hand-crafted brandies to their portfolio of wine products), these could be tasted in traditional snifter glasses, tried in cocktails and in combination with chocolates and canapés. Taking part for the first time were two well-known Cape wine farms. Backsberg, with its 5, 10, 15 and 20 Year Old, was one of the first wine estates to resurrect the traditional craft of potstill brandy-making after the 1990 repeal of laws prohibiting private distillation on wine farms. Historic Blaauwklippen included an unusual apéritif blend of potstill brandy and Noble Late Harvest dessert wine in its potstill portfolio. Another new addition to the steadily growing range of premium brandies being made under the label of more popular, blended brandies (such as Klipdrift Gold), and one which should particularly pique the interest of fans of the well-known Richelieu brand, is the Richelieu 10 Year Old Vintage brandy. It brings a welcome extension to the still-small selection of brandies made in the Vintage category, offering consumers a tipple with a more distinctive wood-maturation character than that of blended and potstill styles. Causing quite a stir at its first appearance in Cape Town after being launched at Fine Brandy Fusion 2012 in Johannesburg, was the rare, exquisitely packaged new potstill brandy from one of South Africa’s most acclaimed distilleries, Van Ryn’s, bearing the intriguing and evocative name AU.RA. With only 107 decanters filled with what is a limited amount of superior potstill brandies aged from between 30 and 40 years in oak barrels, it did not allow for tasting, but a private call line at Van Ryn’s fields enquiries from serious buyers. Sophistication came in the form of one of the Cape Town International Convention Centre’s spacious, airy exhibition halls, transformed into an opulent, but stylish place to be seen. Floor-to-ceiling crushed black velvet wall drapes formed a backdrop to a black, white and gold colour palette reflected in everything from the elegant couches, ottomans and banquettes to the serving counters and tasting tables to the brilliantly back-lit exhibitors’ stands. Deft bartenders kept a steady stream of creative cocktails coming, including this year’s winner of the FHM Brandy Cocktail of the Year, an ethnic combo of brandy, rooibos tea, ginger liqueur, honey and lime called ‘Fynbos’,and the Viceroy Bojito which caused quite a stir at the event..
Fun also came in the form of celebrity appearances by entertainers, musicians, designers, dancers and mixologists. The festival was hosted by MC ProVerb, who is also a SA Brandy guild member. Sterling EQ, DJs Christos, Vinny da Vinci and Tira and a troupe of burlesque dancers added spice to the occasion. The event also profiled the newly launched Urban Brandy Cocktail route, a modern extension of the popular R62 and Western Cape Brandy Routes where visitors could sample 8 unique brandy cocktails at 10 venues around the city scape.